Khanh Nguyen joined the practice in 2014. Having graduated from The University of Queensland in 2007, Khanh has provided her services both in Brisbane and far north Queensland, including at a mobile special needs dental practice. 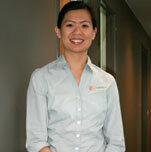 In 2011, Khanh was awarded a scholarship to study a research masters at The University of Melbourne. Her research was focused on adhesive restorations. She is also a clinical demonstrator at the Melbourne Dental School and has presented lectures for Dental Health Services Victoria. Khanh is a member of the Australian Dental Association (Vic Branch), the International Association of Dental Research, and the Academy of Dental Materials.